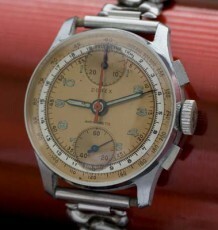 Highly prized Movado chronograph using the F. Piguet movement. 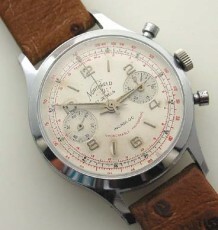 This is perhaps one of the most sought after chronograph wrist watches on the planet. The reason for the demand is the Movado calibre 95M movement used in the watch, it is a Frederic Piguet movement and is the pinnacle of design and function. 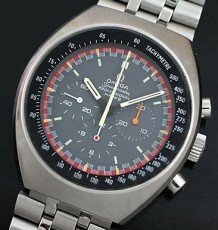 Unlike most chronographs, the stop and start functions are activated by using the bottom button and the reset is done by pressing the top button. 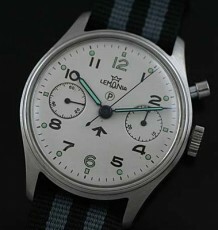 Also note the elegant and highly detailed case design, in particular the starbust pattern on the pushers. 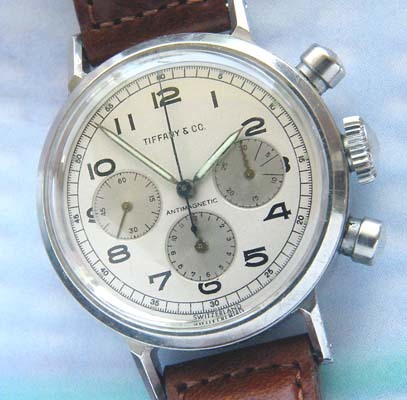 The dial is a recent restoration back to the original which was also signed Tiffany and Co. Another desirable feature of the watch are the hour and minute register hands, which are the original squiggly shaped models. The movement was just serviced by my watchmaker and as such it is excellent time and all of the chronograph functions perform flawlessly.